UPDATE 1/30/19: Some HUGE news! While the snarkiest corners of the art world have been obsessing over the temporary closure of Turrell’s work Meeting or about Kanye West’s $10 million donation to Roden Crater, almost no one has seemed to have notice that one of James Turrell’s earliest skyspaces has been moved to a completely new location. Incredibly, after nearly 30* years of residing on the property of the Center for Contemporary Arts in Santa Fe under a temporary loan agreement, the James Turrell structure Blue Blood is no longer standin in New Mexico. Hannah Hausman, Development Director of CCA confirmed for me that the entirety of the Blue Blood structure was removed from the CCA premises in October 2018 and said that it was transported to a new location. Hausman stated that the CCA and Lannan Foundation found a permanent home for Blue Blood at The Contemporary Austin in Texas, which is headed by Louis Grachos, the Ernest and Sarah Butler Executive Director and CEO of The Contemporary Austin, and former director of SITE Santa Fe. If true, this would be excellent news for Turrell lovers since The Contemporary is in the midst of an extensive, multi-million dollar capital improvement project to its Sculpture Park at Laguna Gloria (presumably where Blue Blood will eventually end up) as well as the Jones Center, its downtown Austin location. The Contemporary appears to be in the process of beefing up its collection for the new Sculpture Park, having recently acquired Iron Tree Trunk by Chinese artist and activist Ai Weiwei. Obviously, this means if you were hoping to get a glimpse of Blue Blood in its original location, this is no longer possible. 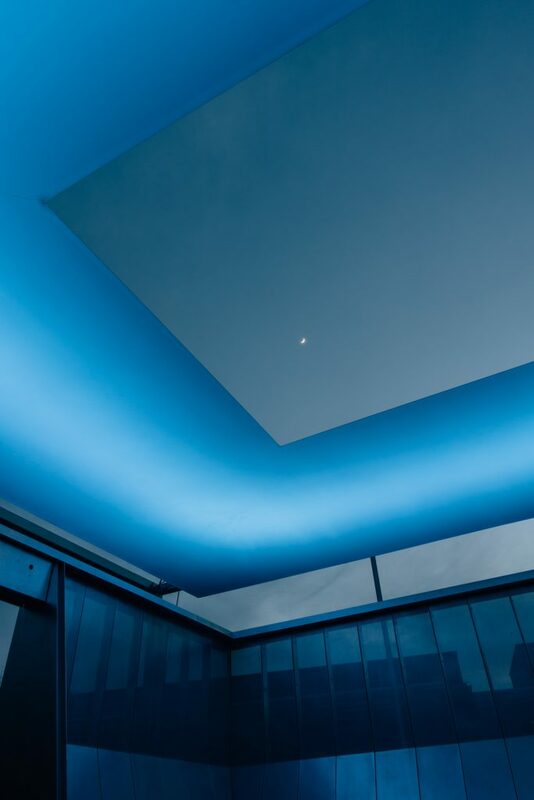 But hopefully, this means that sometime in the near future museum-goers will be able to experience one of the earliest Turrell skyspaces in all its glory – just under the Texas sky. To find out more about Blue Blood’s complicated past, keep reading my original post below. NOTE: I have reached out to The Contemporary Austin for comment and will update this post when I hear back. *There is some conflicting information regarding the original completion date of this work – 1988, 1989, 1998 – see the note further down in this post. 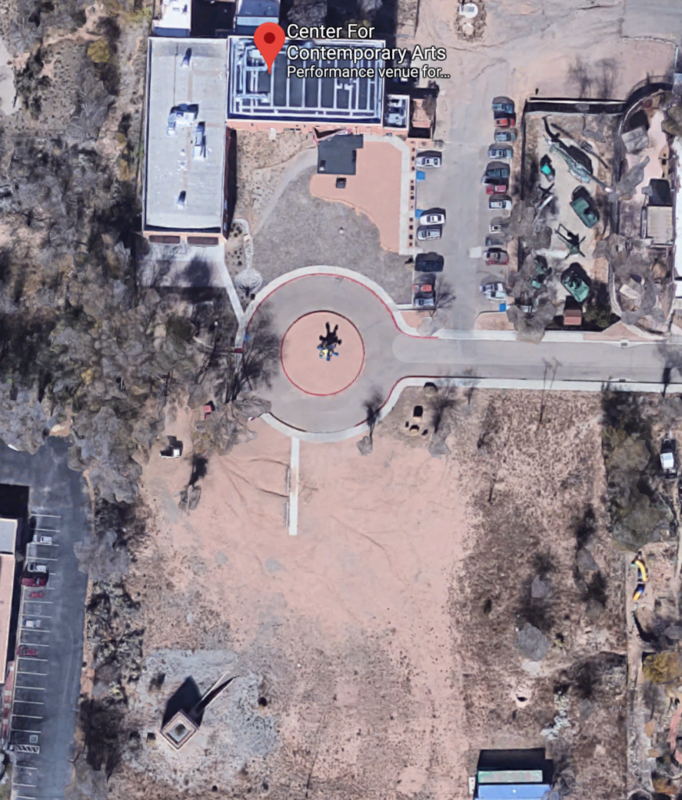 Just over a year ago I was scanning my eyes around a desolate and dusty corner of the land near the Center for Contemporary Art in Santa Fe. As soon as I spotted the building a wave of excitement and relief poured over me. Even though it was only 9:30 in the morning, the New Mexico sun was relentless, so I slid on my sunglasses to cut the glare and get a better look at what I came to see: a boxy adobe-style structure that appeared to be sprouting from a lumpy mound of earth. The surrounding carpet of flaxen weeds and grass only amplified the depressing state of the building. My hiking boots crunched against the gravel-strewn ground as I approached. I was close enough to see the crusty edges of the cracked stucco walls leading up to the entrance and the black wrought iron gate that barred outsiders from entering the building was still erected. The padlock securing the gate looked flimsy enough but getting arrested for breaking and entering while on vacation wasn’t something that appealed to me. So instead, I got close, squatted down and poked my head as far between the wide-set bars as I could and looked up. There it was: a square opening in the dingy white ceiling that perfectly framed a striking patch of blue sky. I was looking at a decommissioned example of one of the earliest known skyspace designs of the famed American artist James Turrell just a few yards away from a church parking lot. Blue Blood is located on the property of the CCA, Santa Fe. I have been a big James Turrell fan for over a decade after falling in love with his work during a visit to the Chichu Art Museum (part of the incredible Benesse Art Site) in Naoshima, Japan where he has a number of immersive artworks permanently installed. To me, Turrell’s works are contemplative, peaceful places that allow you to focus your thoughts on the enormity of space and time. Whenever I am traveling I always google “James Turrell [place where I’m going]” to see if I will be anywhere near a Turrell piece so I can squeeze it into my trip. In nearly all cases I have experienced Turrell works in the context of a museum or gallery such as the Guggenheim (for a 2013 solo show in New York), Henry Art Gallery (Seattle, WA), or ARos (Aarhus, Denmark), or public spaces like the ASU campus in Tempe, AZ. 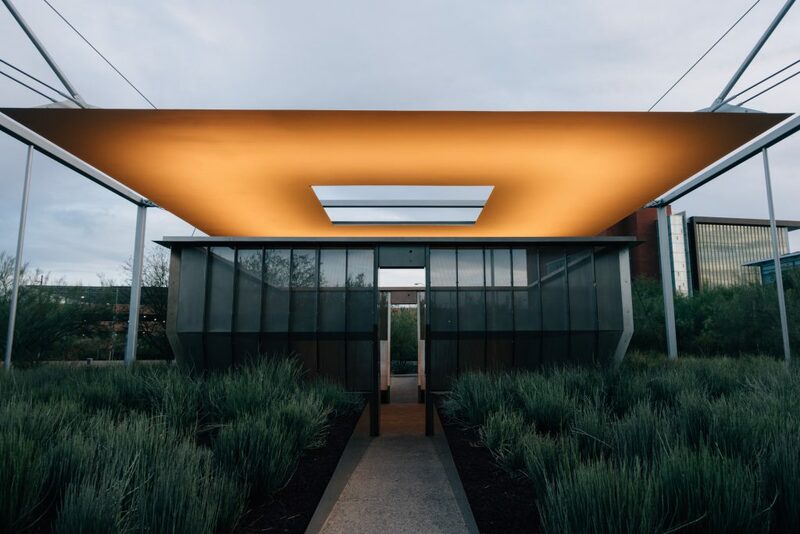 Exterior of Air Apparent by James Turrell on the ASU Tempe campus in Arizona. There’s only been one time I’ve managed to sneak a peek at some privately commissioned work since it was in a semi-public place – a random midtown Manhattan office lobby. 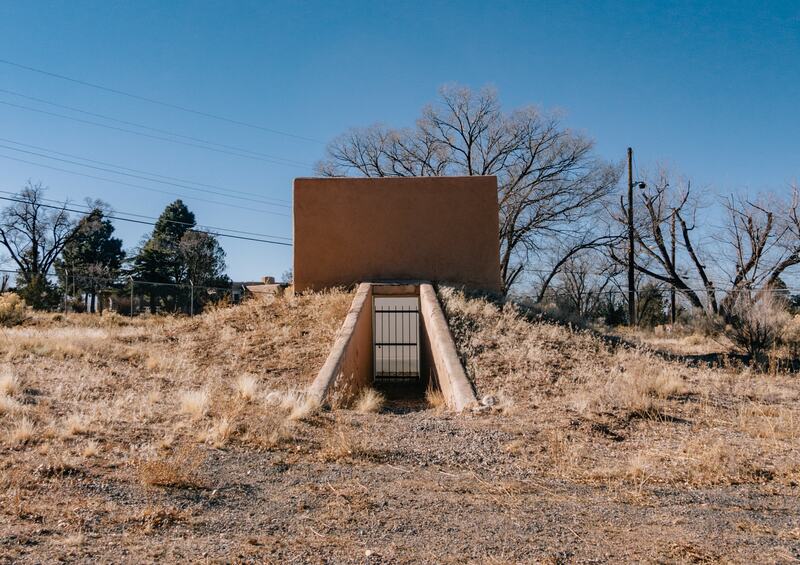 So as you can imagine, I was super intrigued when I found a handful of old articles hinting that I might be able to manage a visit to a hidden, forgotten Turrell work while road tripping around New Mexico. 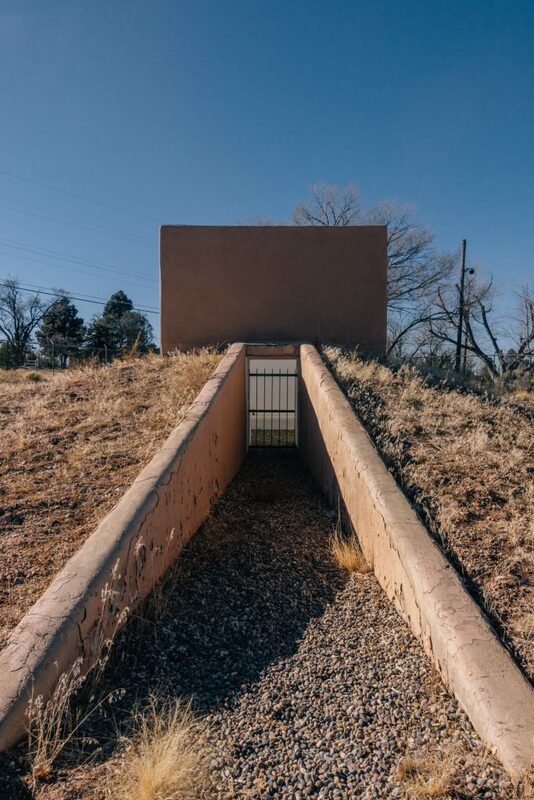 The only other mentions of this forgotten Turrell work I found were two Santa Fe New Mexican articles from the following year reporting on the non-operational state of the structure and CCA’s hope to restore the Turrell work sometime in the future. According to one of the Santa Fe New Mexican articles, for some time after the skyscape was originally finished the museum would open it every Friday around sundown so people could enjoy the work. However, at some point that stopped and even though Turrell’s freestanding structure was still accessible outside of the museum, the artificial lighting no longer worked and it was locked up, preventing people from entering the space. “Surely some progress had been made over the years since this article was published,” I said to myself. However, my search engine powers had failed me. Even though I had the impression that the existence of the Turrell artwork was fairly common knowledge within the Santa Fe art world, reporting about the structure past 2013 was nonexistent. I was baffled. 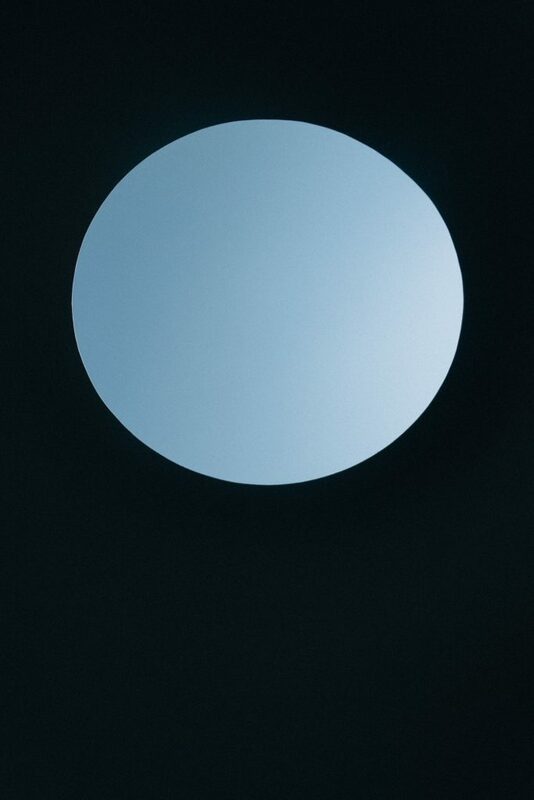 How could it be that this early Turrell artwork had seemingly fallen out of the collective consciousness of the world? Was it even still standing? And could people still see it? That’s what brought me to the CCA that crisp January morning in 2018. I can attest that as of my January 2018 visit that the work was still there. In comparison to the 2012 photos, it looked as though someone had made marginal efforts to clean it up. Large unruly weeds were no longer sticking out from the pebbled floor of the main viewing area. However, it was still barred from people entering. And it didn’t look as though it had gotten those much-needed repairs that John Bienvenu, former president of CCA’s board of directors, told Hyperallergic was one of “one of CCA’s highest priorities” in 2012. I do not know the reason why the artwork originally became inaccessible and why it remains that way – whether it’s due to lack of funds to restore the work or the wishes of the artist himself. 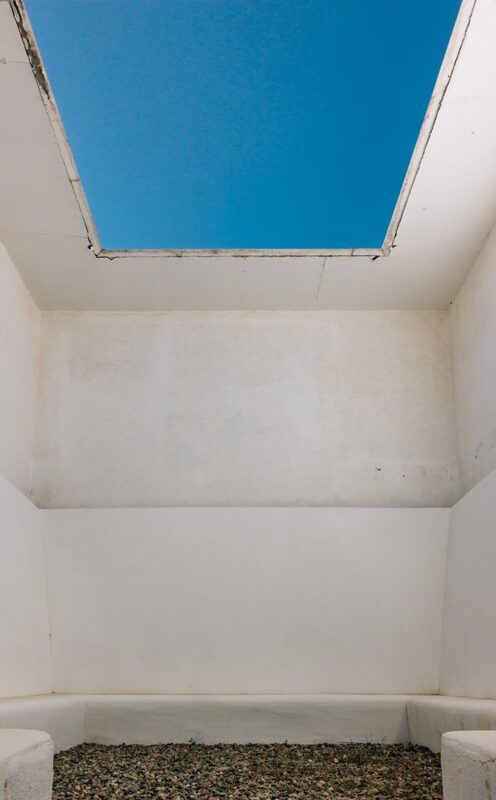 What I do know is that in the meantime art lovers visiting the Santa Fe are missing out on a chance to fully experience the only Turrell work to frame the New Mexico sky. 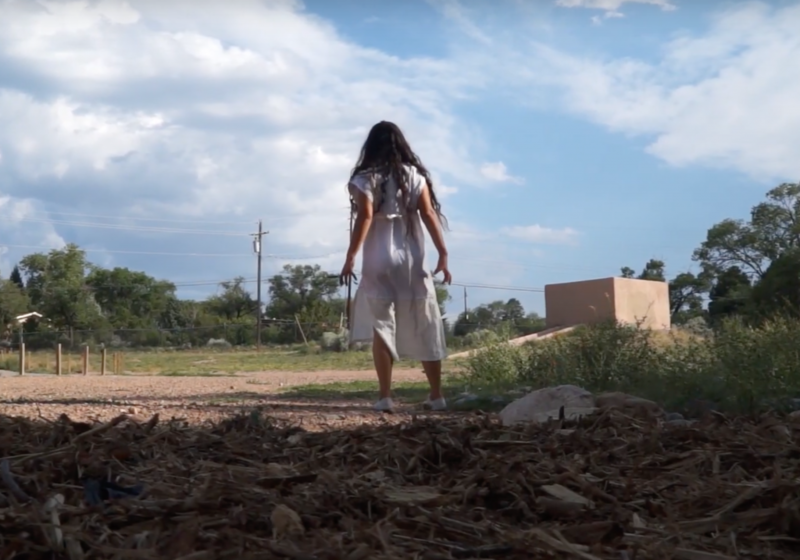 A scene from an uploaded video on Youtube of a 2018 performance of Micaela Gardner’s “Armory” at CCA. The Turrell structure can be seen in the background. In December 2018, the CCA announced changes to their leadership team, with G. Sterling Zinsmeyer as Interim Executive Director and Maria Gale as CCA’s Board Chair. Perhaps these newly installed executives will have a renewed interest and commitment to getting Blue Blood back to its original glory. If not, we all can just @ kanyewest to see if there’s something he can do about it. If you are still interested in seeing Blue Blood in its current state, it’s easy enough to locate. The Center for Contemporary Arts is located at 1050 Old Pecos Trail, Santa Fe, NM 87505. The Turrell structure sits on the southwest corner of the CCA property, nearest East Barcelona Road and adjacent to the Immanuel Lutheran Church LCMS parking lot. If you are standing in the CCA’s circular driveway with your back towards the main building you will see a small square structure in the distance to the right near the property border fence. When I visited in 2018 there was no barrier prohibiting you walking up to the structure. Judging by Instagram photos taken more recently, it seems like you can still walk up to it and get a peek. However, if you do choose to visit the work, please be mindful and do not attempt to enter or damage the structure in any way. The Turrell structure can be seen on the CCA property in Google Maps satellite photos, lower left hand corner. Do you have any additional information as to the history of Blue Blood and why it fell upon hard times and remains inaccessible today? Have you visited the structure and have your own story to tell? I’d love to hear about it – please leave your thoughts in the comments! I went inside on June 2017, l was amazed that it is basically the only Turrell Skyspace that has been neglected. I showed James Turrell’s Daughter the pictures when l came back and she didn’t even know it existed. Apparently issues over misuse, vandalism etc closed access over the years. Just yesterday I was told there had been encroachment on a neighboring property. However, checking the plat w/ the CO assessor, this is clearly not the case. The church next door has often opposed the structure being used by homeless. The property is owned by the state, therefore it is my believe, that the state arts council is in neglegd re: Stuart ship of the installation in hand w/ Lannan. Knowing the structure well, it is a mystery to me, how an apparent relocation should have worked exactly. Word from members of the CCA team, the installation was actually demolished. Wow, the plot thickens. I too was very perplexed by the idea that the skyspace – which would have been site-specific – would be moved to a different location, however, CCA told me it was removed and transported to The Contemporary Austin when I asked them for comment. I haven’t heard anything back from The Contemporary Austin confirming that they actually have the structure. (There are no public announcements or press releases about an acquisition.) I would be gutted if the structure was destroyed. That would have been an absolute shame. Surely someone in the Santa Fe arts community knows the real deal on what happened? possession. Since we have a new leadership in the state now, positions at the nmarts.org got reshuffled. However, under >About, >Contact Arts Staff you might find the appropriate person to contact. Needless to say, in a city which prides itself to be on the forefront of the arts globally, this event and the misinformation by CCA is hideous, disrespectful and very troublesome. Thank you for this post. It has answered a lot of questions many folks have!